BlackBerry CEO doesn't like the iPhone | BlackBerry Blast! It probably comes as no surprise but the CEO of BlackBerry maker RIM, doesn't like the iPhone. 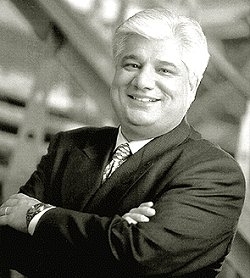 RIM CEO Mike Lazaridis told European reporters in Waterloo, Canada last week, that the iPhone won't be a threat to the BlackBerry. Lazaridis said, "the iPhone has severe limitations when it comes to effortless typing. Of course you have more screen space, with more artistic interactions, but that's not enough. We've seen this before when Palm tried virtual keyboards. When they launched the Treo they licensed our keyboard." Amazingly Lazaridis is grateful for Apple's marketing of the iPhone. "Apple undeniably accelerated the drive to smart phones. It educated the consumer to the benefits of these types of phones. We saw our sales go up with AT&T after the iPhone came out."